Rabada surges to summit of Test rankings! 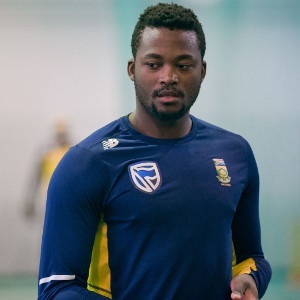 Durban - The Dolphins jet off to the Western Cape ahead of their crucial One Day Cup clash with table toppers the Cape Cobras on Wednesday at Boland Park in Paarl with the news that Andile Phehlukwayo will be available for selection. The all-rounder has been with the Proteas Test squad for their first Test of the Freedom Series against India - where the Proteas won by 72 runs at Newlands. Phehlukwayo's return will give the Dolphins selectors a tough time in picking their starting XI. The Dolphins go into their clash on Wednesday having beaten the Warriors in Port Elizabeth last week. And after defeating the Cobras in their opening game of the campaign, the Durban-franchise will be confident heading to the Winelands. Last season the Dolphins pulled off a memorable four wicket win in Paarl when Sibz Makhanya scored an unbeaten 55 from 38 balls to help his side chase down 271 with five balls to spare. Makhanya and Kyle Nipper (32) added 57 for the seventh wicket to get their side over the line. Despite beating the Cobras by 26 runs in their opening One Day Cup clash at Kingsmead, coach Grant Morgan believes that the Cape outfit has improved. "They are going to be a big threat for us on Wednesday," Morgan expressed. "They've been through their pain and they have been through the period where they came under some criticism. "I think now they have found their best balance and we are going to have to be at our best to beat them." With two wins from three matches and a game in hand going into Wednesday's clash, the Dolphins currently sit in third place on the One Day Cup log. The mood in Morgan's camp is upbeat ahead of a defining week of the 50 over competition. "The guys are helping each other out in training which I find is a very good sign - it is a sign of maturity in the group. "This is probably the best space that we have been in since I have been involved and there is a high care factor among the players and a huge willingness to see each other succeed," the coach added. Despite the absence of Vaughn van Jaarsveld, who hasn't recovered from a dislocated finger, the Dolphins' batting has been solid throughout the three matches with Cody Chetty registering a valuable half century in Port Elizabeth. With Chetty's form as well as the form of the all-rounders, it puts the Dolphins in a strong position from a batting perspective. "Our all-rounders like Rob (Frylinck), Calvin (Savage), Sen (Muthusamy) and Prenelan (Subrayen) have got to the stage now where they don't allow, for example, their batting to suffer if they bowl well. "They are too good and are now taking on true all-rounder status," Morgan said confidently. With the ongoing drought gripping the Western Cape, Morgan is expecting the pitch to be a dry one. This could play into the Dolphins' hands with four spinners in the squad. "We are expecting it to be a dry surface and we will be quite surprised if we get something different," he mentioned. "With that said we have got cover in all areas so we are not worried about conditions." Having got two wins under the belt and a loss that came off the final ball, Morgan believes his team has a lot more to give in this competition. "I don't think that we have hit our straps yet," said Morgan. "The challenge for us is to find our A-game because we have been hovering around a B-plus at the moment." Dane Vilas is a doubt for Wednesday as his wife Pippa is still expecting the birth of their child. The Cobras and Dolphins game starts at 13:30 in Paarl.